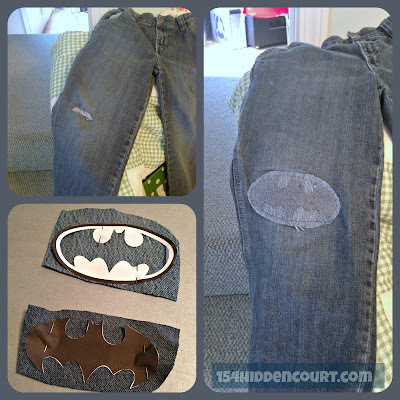 154 Hidden Court: Patching boys' jeans - superhero style! 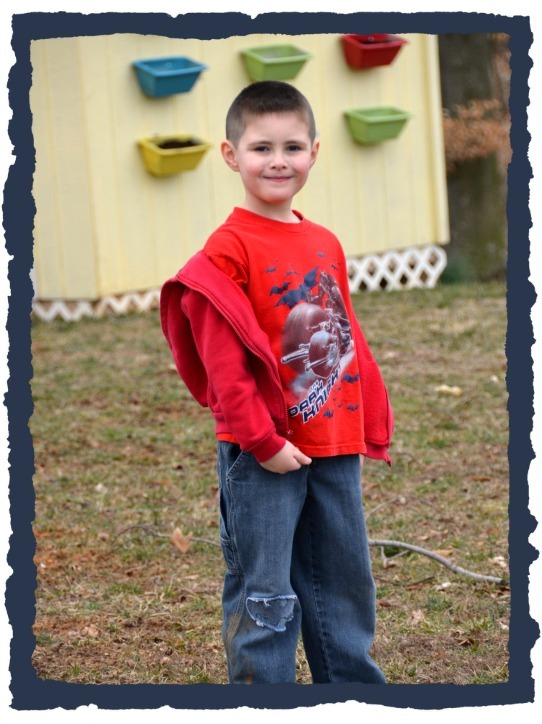 Patching boys' jeans - superhero style! My boys are ROUGH on clothes. Cheap clothes, expensive clothes, it doesn't matter. They are rough. I've learned my lesson and now I refuse to spend much on what they wear, instead opting for yard sales and discount stores to stock up on a quantity of what I think of as "disposable" pieces. This late in the school year, I absolutely REFUSE to buy Zachary anything else to wear. Instead I'm trying to eke whatever usage I can out of the tattered remnants of what he already owns. The kid grew an inch last month. I'm just NOT buying new clothes right now. So anyway, when he burst through the knee of yet another pair of jeans a couple weeks back, I said to myself, "Self, you can totally fix this." Then I though to myself, "Self, this doesn't have to be any boring old patch. You can make it a super cool patch - one that won't get your kid beat up on the playground because it's all lame and patchy like." Pinterest directed me toward a ton of cute monster face patches, and I would totally do those for Cooper, or myself, maybe. But Zachary needed something better. Something different. TADA! I used a Batman symbol to patch his jeans. The process was super easy. First I found a Batman logo online and printed it out in the size I needed, then cut it out. Next I used two different shades of denim - one for the background oval and one for the bat itself. I pinned the paper logos into place on my denim scraps and cut them out. I used denim colored thread to hand sew the oval into place, then I sewed the bat over the oval. When I was stitching the oval in place, I sewed about a quarter inch inside the edge of the fabric so it would fray and look cool after it was washed a few times. These quickly became Zachary's favorite pair of jeans, and now I can't wait until he rips through another pair so I can do it again. I'm sure it won't be long.